This book addresses both multi robot systems and miniaturization to the nanoscale from a unifying point of view, but without leaving aside typical particularities of either. The unifying aspect is based on the concept of information minimization whose precise formulation is the Haken-Levi-principle. The authors introduce basic concepts of multi-component self-organizing systems such as order parameters (well known from equilibrium and non-equilibrium phase transitions) and the slaving principle (which establishes a link to dynamical systems). Among explicit examples is the docking manoeuvre of two robots in two and three dimensions. 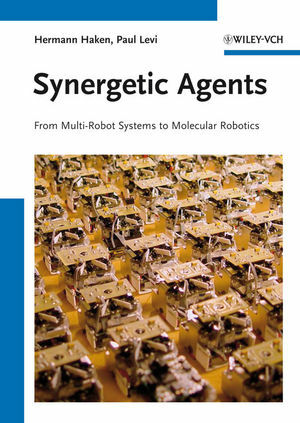 The second part of the book deals with the rather recently arising field of molecular robotics. It is particularly here where nature has become a highly influential teacher for the construction of robots. In living biological cells astounding phenomena occur: there are molecules (proteins) that literally walk on polymer strands and transport loads that are heavier than their carriers, or molecules that, by joint action, contract muscles. The book provides the reader with an insight into these phenomena, especially by a detailed theoretical treatment of the molecular mechanism of muscle contraction. At the molecular level, for an appropriate approach the use of quantum theory is indispensable. The authors introduce and use it in a form that avoids all the clumsy calculations of wave-functions. They present a model which is based on an elementary version of quantum field theory and allows taking into account the impact of the surrounding on the quantum mechanical activity of a single molecule. By presenting explicit and pedagogical examples, the reader gets acquainted with the appropriate modelling of the walking behaviour of single molecular robots and their collective behaviour. The further development of multi-robot systems and particularly of molecular robots will require the cooperation of a variety of disciplines. Therefore the book appeals to a wide audience including researchers, instructors, and advanced graduate students. Hermann Haken is Professor of the Institute for Theoretical Physics at the University of Stuttgart. He is known as the founder of synergetics. His research has been in nonlinear optics (in particular laser physics), solid state physics, statistical physics, and group theory. After the implementation of the first laser in 1960, Professor Haken developed his institute to an international center for laser theory. The interpretation of the laser principles as self organization of non equilibrium systems paved the way to the development of synergetics, of which Haken is recognized as the founder. Hermann Haken has been visiting professor or guest scientist in England, France, Japan, USA, Russia, and China. He is the author of some 23 textbooks and monographs that cover an impressive number of topics from laser physics to synergetics, and editor of a book series in synergetics. For his pathbreaking work and his influence on academic research, he has been awarded many-times. Among others, he is member of the Order "Pour le merite" and received the Max Planck Medal in 1990. Paul Levi is Full Professor for Informatics in the Institute for Parallel and Distributed Systems of the University of Stuttgart, Germany. He graduated in physics and computer science and became a senior research scientist in informatics and robotics, and Head of the Department of Technical Expert Systems and Robotics at the University of Karlsruhe. In 1988 he was appointed Professor at the Technical University of Munich, and scientific member of the Bavarian Center for Knowledge-Based Systems. Later on he served as Director of the Institute for Parallel and Distributed High Performance Computers at the University of Stuttgart. He is Member of the Management Board of the Centre for Computer Science (FZI) and Director of the Division Intelligent Systems and Production Engineering (ISPE), Karlsruhe, Germany. Paul Levi's main research fields include computer vision, robotics, distributed AI and multi-agent systems. He has authored and co-authored both textbooks and monographs.